Liferay Home is one folder above the domain to which you will be installing Liferay. For example, if your domain location is /Oracle/Middleware/user_projects/domains/base_domain, then your Liferay Home is /Oracle/Middleware/user_projects/domains. For this section, we will use $WEBLOGIC_HOME to refer to your WebLogic server’s installation /Oracle/Middleware. If you still have the mainWebApp module installed, remove it first. Note: There is a known issue with the Sun and JRockit JVMs bundled with WebLogic 10.3.2 (see http://bugs.sun.com/view_bug.do?bug_id=6795561). To resolve this, use Sun JVM 1.6.0_u24 or JRockit JVM 1.6.0_24. Let’s get started by installing the JAR files Liferay needs. Liferay needs the JAR files contained in the Liferay Dependencies Archive and the driver JAR file applicable for your database. Navigate to the folder that corresponds to the domain to which you will be installing Liferay. Inside this folder is a lib folder. Unzip the Liferay Dependencies Archive to this folder so the dependency .jar files reside in the lib folder. So far so good. Your JAR files are in place and ready for Liferay. Start Oracle WebLogic if you want to configure your database and/or mail session within Oracle WebLogic. Select Services → Data Sources. Click New → Generic Data Source. Give your data source a name, such as Liferay Data Source. The JNDI name should be jdbc/LiferayPool. Choose the type of database and click Next. From the screenshot, you can see we have chosen MySQL. The database driver class is selected automatically. Click Next three times. You should be on the Connection Properties screen. Enter the database name, the host name, the port, the database user name and the password. 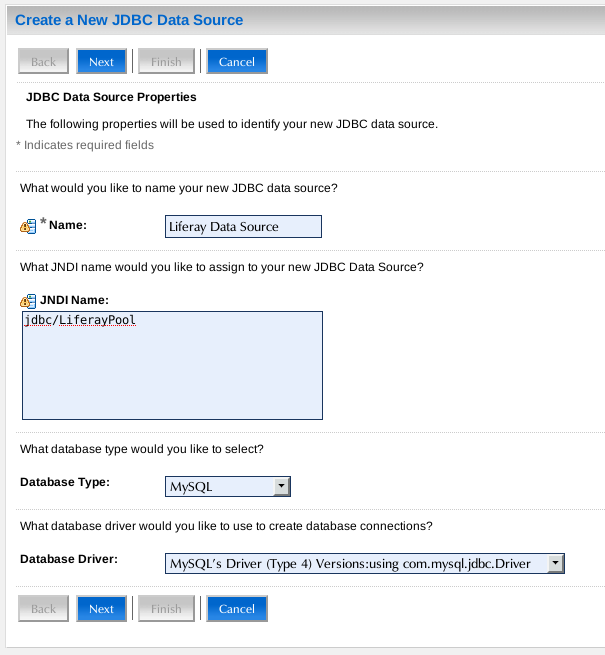 WebLogic uses this information to construct the appropriate JDBC URL to connect to your database. Click Next. WebLogic next confirms the information you provided. For MySQL, some additional parameters must be added to the URL. Modify the JDBC URL so it has the proper parameters. Provide your database name, host name, user name and password as the values. Click Next. Click Test Configuration to make sure WebLogic can connect to your database successfully. When it does, click Finish. You will be back to the list of data sources. 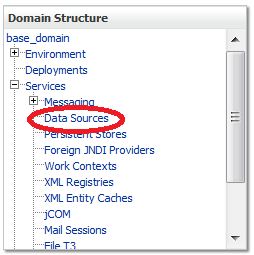 Notice your new data source has no value in the Target column. Click on your data source to edit it. Click the Targets tab and check off the server instance(s) to which you wish to deploy your data source. Then click Save. Next, let’s configure a mail session in WebLogic. 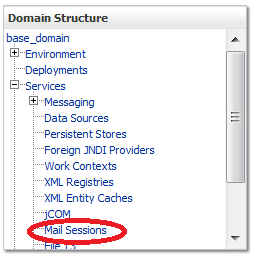 Select Mail Sessions and create a new mail session which points to your mail server. Give it the name Liferay Mail and give it the JNDI name of mail/MailSession and click Next. Choose your server and then click Finish. Now let’s make sure Liferay can access this mail session. Create a portal-ext.properties file in the Liferay Home folder, which is one folder up from your domain’s home folder. If you are using Liferay Portal to manage your data source, follow the instructions in the Deploy Liferay section for using the setup wizard. If want to use Liferay Portal to manage your mail session, you can configure the mail session in the Control Panel. After starting your portal as described in the Deploy Liferay section, go to Control Panel → Server Administration → Mail and enter the settings for your mail session. Now its the moment you’ve been waiting for: Liferay deployment! This section provides instructions for deploying Liferay to your application server domain. Now, let’s deploy Liferay Portal. Select Deployments and click the Install button. 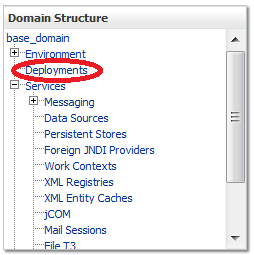 Upload jsf-1.2.war from WebLogic’s common files directory and select Install this deployment as a library. After installing the JSF libraries, go back to deployments and select the Liferay .war file from the file system or click the Upload Your File(s) link to upload it and then click Next. If the default name is appropriate for your installation, keep it. Otherwise, give it a name of your choosing and click Next. Click Finish. After the deployment finishes, click Save. Please see the section above for how to use the setup wizard. Note: After Liferay is installed, you may see an error initializing the Web Proxy portlet. Because the XSL parser configured by default within WebLogic cannot compile a style sheet in this portlet, Liferay disables it by default. To re-enable this portlet, extract xalan.jar and serializer.jar from the Liferay .war archive and copy them to your JDK’s endorsed folder for libraries. If you are using JRockit, this folder may be [$WEBLOGIC_HOME]/jrockit_160_05/jre/lib/ext; if your are using Sun JDK, this folder may be [$WEBLOGIC_HOME]/jdk160_24/jre/lib/ext. Congratulations! You are now running Liferay on Oracle WebLogic.